What is a permanent orienteering course? It is a number of permanent control points (usually about 20) identified by sturdy wooden posts with a code and an orienteering logo carved or painted on it. All the controls are shown on an overprinted map. They are usually situated in local parks or forests owned by councils, the National Trust or Forest Enterprise. Management of the courses may be by the owner of the land, or by the local orienteering club. What is the purpose of permanent orienteering courses? The courses have many purposes, depending on your own specific needs. The great thing about them is that you can go at a time to suit you, on whatever day of the week you choose. If you are an experienced orienteer you may use them to fine tune some techniques, maybe pace counting, relocation or line orienteering. They are also an ideal way of introducing children and adults alike to the sport, where you can go at your own pace and spend as much time as you like figuring out the map. If you want to go in a pair or as a group, again, this is the perfect opportunity. You may have just started orienteering and want to gain confidence in your skills outside of the pressures of an organized competition. So whether you are using them for training purposes or just for a more adventurous family stroll, the choice is entirely yours. SLOW have arranged a number of permanent orienteering courses in south and west London. Details of the courses are below, and maps are available through British Orienteering’s directory of permanent courses – the links below take you straight to the relevant page. 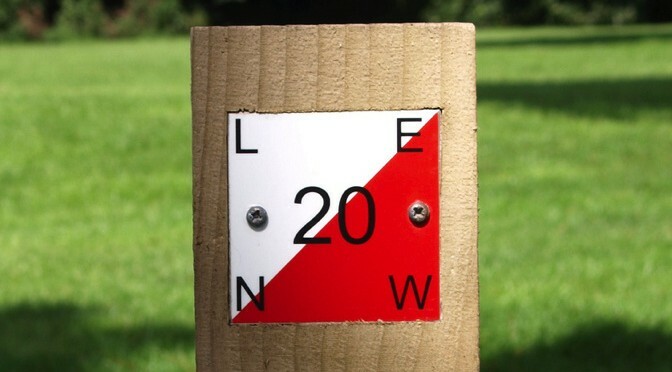 Esher Commons offers genuine forest orienteering within the M25, and it’s where SLOW has the biggest range of permanent courses, including some that are more difficult than our other areas. There two yellow courses of 1.5km will suit beginners, and there are three other courses; the hardest is a 5km blue course for experienced orienteers. The start and finish is at Horseshoe Clump car park, where Blackhills meets Portsmouth Road. This is due west of postcode KT10 9JW, and next to Blackhills bus stop on route 515. This park has a very rural feel and more contours than in most of London. Five relatively easy courses up to 2.5km. As well as British Orienteering, maps are available rom Elthorne Sports Centre, Westbury Road, off Boston Road, Hanwell, London, W7 2AD; telephone 020 8579 3226. This lovely tranquil park partly set under the elevated section of the M4 offers some surprisingly interesting orienteering. Four relatively easy courses are available up to 1.4km. There is a car park in the park, or the nearest station is Brentford. Wimbledon Park, next door to the All England Lawn Tennis Club, has easy courses up to 1.8km. This PDF document gives more information about what courses you can do in Wimbledon Park. This is a surprisingly interesting park close to central London, and conveniently located very close to Maida Vale tube station. There are eight courses available from 0.5km to 1.6km. More details and opening times see the Paddington Recreation Ground website.